Charlotte is more vibrant than ever! There is always something exciting to do or see. Whether it is taking in a show, enjoying an outdoor festival, attending a community class, or simply hanging out and enjoying Charlotte’s unique culture. It is the people that make Charlotte special. This is a place to work, live and call home. Charlotte is a town full of friendly neighbors and gorgeous scenery. The south side of the city is particularly popular for a number of reasons. South Charlotte NC homes for sale are within price ranges most employed people can afford, and with vast development plans in the works, this area’s economy is one of the best in all of the Carolinas. You’ll find that this area is the second largest banking center in the entire country, including being the base for Bank of America and Wachovia, among many other Fortune 500 companies. There are still jobs here, and it will only get better with the spread of developments across the area. That’s why Charlotte homes for sale and South Charlotte homes for sale are in demand. In 2007, Forbes declared Charlotte the third most undervalued real estate market in the country. Relocate-America.com, in the following year, ranked Charlotte #1 in their annual series of “Best Places to Live in America” based on affordability, crime rates, and employment opportunities. Business owners will be pleased to learn that CNNMoney.com gave this city 8th place out of 100 slots in their “Best Places to Live and Launch” list. Charlotte real estate offers more than meets the eye. The awards the city has won make this area much less typical than the run-of-the-mill metropolis. It’s equipped with big-city commodities and people, but the population doesn’t get in the way of enjoying what’s there. So if you’re thinking of investing or settling down, Charlotte is a great choice. You may also want to explore some of the towns in South Charlotte by looking at Mint Hill homes for sale or real estate in Matthews, NC. If you want to live in this tranquil area, call or email me. My name is Jennifer Manchester, and I have years of experience making dreams happen. 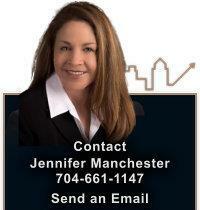 Simply contact me today to find Charlotte homes for sale that match your needs and your finances. A stone's throw from the million-dollar homes of Myers Park, this unlikely community of renovated bungalows, public housing and boarded-up buildings is the city's oldest surviving black neighborhood. Cherry was named in 1891, but local historians say the neighborhood probably predates the Civil War. Charlotte's oldest streetcar suburb, is known for its renovated bungalows and churches. East Boulevard forms the neighborhood's spine, offering restaurants, shops and office space within easy walking distance of nearby homes. Developed on two dairy farms southeast of center city, Eastover was the first Charlotte suburb with driveways for "motorcars." The neighborhood's stately homes have long attracted the leaders who helped shape Charlotte's growth, including banker Hugh McColl Jr. and department store scion John Belk. A landmark is the Mint Museum of Art. It's home to two major hospitals, North Carolina's largest community college and the city's oldest park. But Elizabeth also has a mix of housing, from brick mansions to new townhomes. The neighborhood was home to department store magnate William Henry Belk, and the city's first neighborhood movie theater, the Visulite on Elizabeth Avenue. Just east of the center city, Plaza-Midwood is a hip neighborhood of restored bungalows, funky shops and places to eat. On Central Avenue, you'll find tattoo parlors, antique shops, pawn shops, clothing boutiques and a bookstore. Try a burger at The Penguin or pizza by the slice at Fuel Pizza Cafe, in a restored 1936 filling station. There is no better introduction to Charlotte than a drive down Queens Road in Myers Park. Myers Park emerged from a cotton farm in south Charlotte in 1911, when landscape architect John Nolen was hired to create a "garden suburb." Nolen opted for curving streets that followed the landscape. The North Davidson Arts District is a former mill neighborhood that has been transformed into a funky arts district with galleries, eateries and performance halls. This northwest Charlotte suburb off Beatties Ford Road was developed in 1913 as a suburb especially for middle-income blacks. Today, it's home to a mix of housing, from historic bungalows to new Habitat for Humanity homes and duplexes. Wilmore has experienced a recent revival, mostly due to its proximity to trendy South End. Urban pioneers have been buying and remodeling its turn-of-the-century bungalows, and developers have started to show interest. Developed around 1920, this neighborhood on Charlotte's northwest side is a designated historic district in the shadow of the city's skyline. It's one of the few places in town to get a Dilworth-style bungalow for less than $150,000. But some renovated homes are selling for more than $300,000.